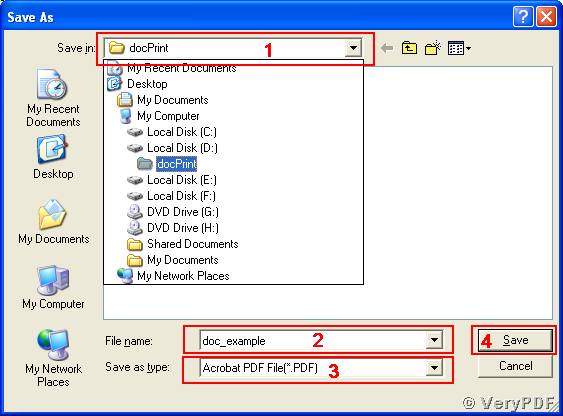 ← How to print OpenOffice Impress to PDF file? 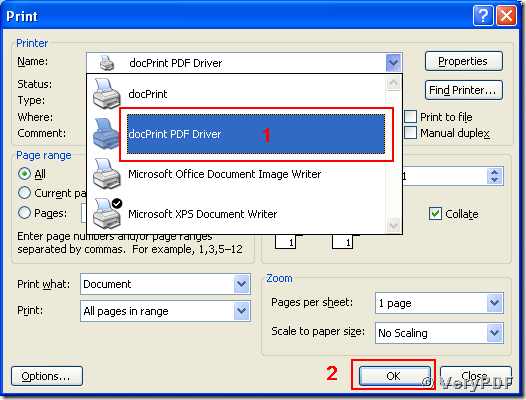 You can convert a Microsoft Office document in format of doc to pdf files usingDocument Converter as a system printer. 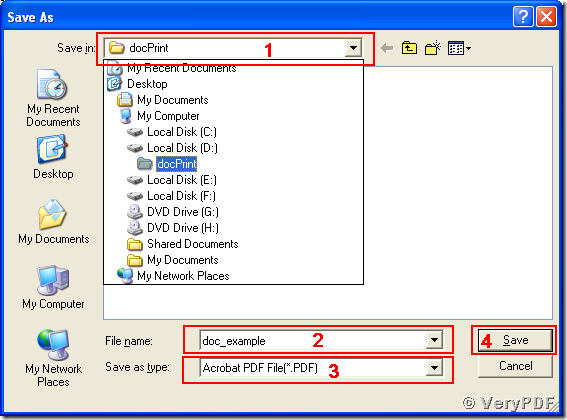 The docPrint Document Converter is able to convert printable files between any two commonly used file formats. The article is to present some examples for guiding you to converting your word document from doc to pdf, ps and eps files with the printing function of the Microsoft operating system. To enable the function of converting file formats via system printing process, you should install the virtual printers provided by docPrint Document Converter. You may download the software at http://www.verypdf.com/artprint/index.html#dl and install it into your Windows system. There must be two newly added virtual printers named “docPrint” and “docPrint PDF Driver”, respectively, after the installation. 1, Open the document with your Microsoft Office Word and edit it for the coming conversion. 2, Call the system printing process via the menu path “File –> Print…” in your MS Word application window. You may also call the print process using the shortcut key “Ctrl + P”. A dialog box of “Print” will pop up indicating the printing process is started. 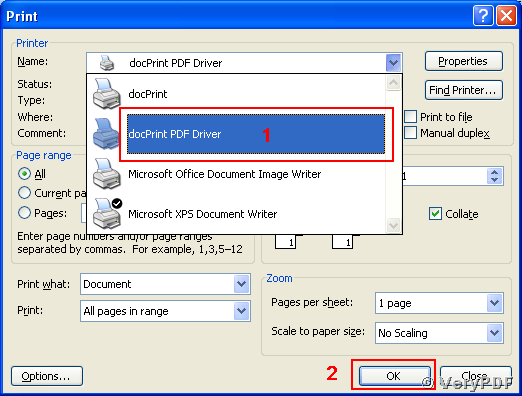 3, Select “docPrint PDF Driver” in the combo box of Printer-name and then press “OK” button in the popup “Print” dialog box as shown in the following picture. Another popup dialog box named “Save As” will come out. 4, Select the output path for saving the file in the combo box “Save in”, input the output file name in the editable combo box “File name”, select “Acrobat PDF File (*.PDF)” in the “Save as type” dropdown list and press “Save” button in the “Save As” dialog, then the conversion from doc to pdf is completed. The steps for converting doc to ps are similar to those for converting doc to pdf. The difference is, in Step 4, choosing “Postscript File (*.PS)” instead in the dropdown list of the “Save As” dialog box as shown in the next snapshot. For converting doc to eps, perform the same four steps with those of converting doc to ps and choose “EPS File (*.EPS)” instead of “PS” in the “Save As” dialog box of Step 4, then the document is converted from doc to eps. The way to print doc to eps? How to convert documents of Microsoft Office Excel to PSD? This entry was posted in docPrint Pro and tagged doc to eps, doc to pdf, doc to ps, doc2pdf, docPrint. Bookmark the permalink.